Your new home in space. Your new home under the Abzu sea. Your new home in space. Far from where you ought to be. Remember when the Head Surgeon used to be a real person instead of cardboard box? 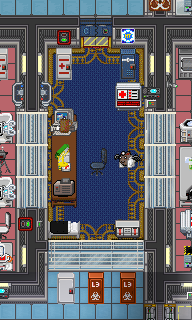 Well, the Medical Director basically has the same responsibilities: coordinate MedSci's efforts, work together with the other heads of staff to ensure that medbay doesn't run out of supplies and help out when one of your departments happens to be understaffed. 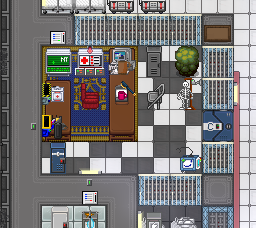 As the MDir, you are the head of the frequently understaffed Medical Department and the Roboticists, Geneticists, and Medical Doctors that may or may not exist. As their boss, you should be familiar with basic as well as advanced medical procedures and should be at least somewhat proficient in the field of human augmentation. Knowing your way around in pathology is a plus. Construction and maintenance of cyborgs may also require your attention if Robotics is understaffed. Power cell upgrades, module rewrites, and limb replacements are just about the only things cyborgs can't do by themselves, so it's a nice gesture to lend them a hand. Since you are already there, why don't you build a medibot as well? Another major aspect of your position is logistics. 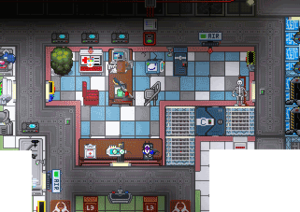 The lockers and vending machines stock a decent amount of medicine, but with greyshirts constantly streaming in, greedy chemists and just plain wasteful use of resources, medbay can and will burn through supplies incredibly quickly. While you can try to split the highly-desired hyposprays and healing patches between the doctors, it might not be enough in the long term. Thankfully, your ID card provides the access and credentials to address these problems! 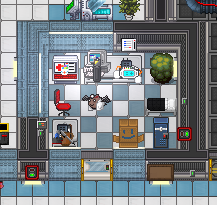 Head down to QM, order some medical supply crates or raw materials for the medical manufacturer and have them send to the MedSci cargo dock or M.U.L.E. 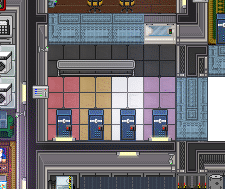 delivery beacon in medbay. If they happen to be out of cash, use the bank records in customs or your own account to channel funds their way. Another feasible option is to enlist the mechanics. In return for new toys to play with (just let them scan anything they want), they will likely be happy to deliver a new medical vending machine or a couple of replacement defibrillators on request. You should also be aware that if the solars and engine are out of action, medbay is one of the first areas to lose equipment power, frequently bringing down the Cloner in the process. Yell at the engineers occasionally to do their damn job. 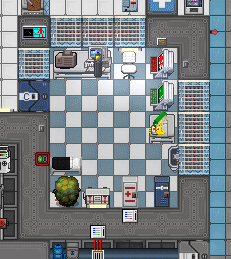 As Medical Director, you can make your job, Medical Department's, and the entire crew's jobs easier by giving people Health Monitor Implants. 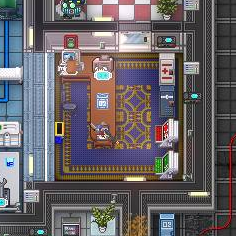 These handy little devices will replace the standard health indicator with a more detailed damage type indicator and will alert medical PDAs when the implantee is in critical condition or dies, significantly reducing the amount of time it'll take to bring them medical aid or send them off to cloning or Robotics. They can be made in the Medical Fabricator and Robotics Manufacturer, and you give them out to people with an implanter or your trusty implant gun. Every medical PDA receives an alert should a body arrive in the morgue, yet many people have a "couldn't care less" attitude about reviving the dead. You shouldn't! Check the morgue on a regular basis and ensure they actually make it to genetics or, at the very least, robotics. It might also be worthwhile to label useless bodies (braindead, borged, cloned, suicided) or simply give them to the chef or chaplain, so the same waste doesn't end up in medbay over and over again. When nothing is going on, joining the quest for superpowers or researching diseases can be interesting too! As the guy in charge, remember that communication is the key! Encourage your team to stay in touch via the medical channel, a frequency which is more often than not absolutely quiet. It's much easier to perform triage and deal with the victims of a mass bombing in an organized, efficient manner if the skills and equipment of everybody are known. If everything else fails, there is at least one doctor you can always count on: Dr. Acula, the friendly bat. Ensure that Dr. Acula escapes on the shuttle. If you keep him in your office, he'll usually make it through most of the round. Save for Atlas and to some extent Cogmap1 and Destiny, your office is fairly far away from the most common bombing targets in Medbay and the general station. Once the shuttle's called, haul him towards the Escape Arm somewhere within the six minutes of the shuttle's trip to the station, so you as much time as possible to deal with any complications. Ideally, you should store in him in a crate or locker or keep him in some room just a few seconds away from the Escape Arm, so that anybody who tries to bomb or rampage Escape doesn't hurt your pet bat in the process. Once Dr. Acula is actually on the shuttle, you're basically home free. So long as you store him in a locker or put him in the cockpit or medical bay, he should make it through any last-minute shuttle bombings. So, you have been sent by the Syndicate? Working for them isn't unlike a regular contract doctor, but significantly more access and an aura of authority leave you with more options to get the dirty job done. As a head of staff, the AI will be more willing to open doors...or you could just lay in ambush on the bridge and sedate the Captain. With a bit of persuasion, you can also arrange that your target doesn't receive medical treatment and conveniently forget about certain bodies in the morgue. Not to mention unusual methods of surgery - all in the name of medical research, of course! This page was last modified on 4 April 2019, at 01:05.